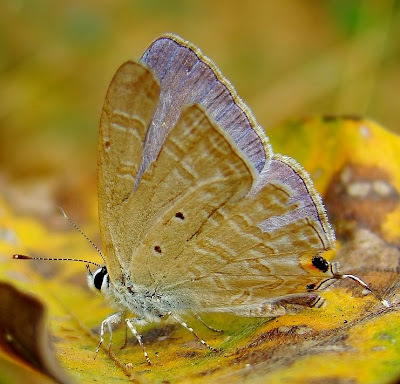 These two Lycaenids cause much confusion in amateur butterfly watchers. Here's one note on how to distinguish them. 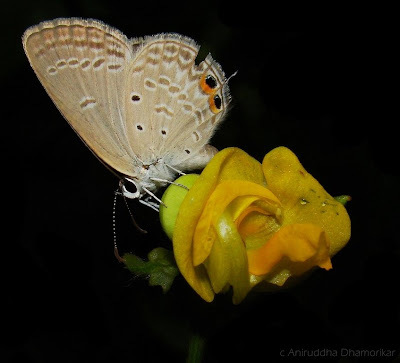 Gram Blue, Euchrysops cnejus – is a common Lycaenid of India. Distributed throughout the southern and western regions, it is not found in the higher altitudes. The adults might live in a group of around 10 – 20 in a square meter area which is a high number where males fight for a partner. 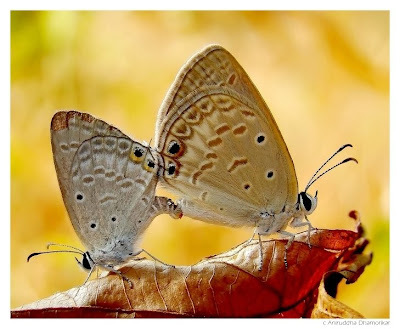 A several males will try to mate with a female; however only one succeeds in mating. Gram Blues are often seen with several other blues, such as Pea Blue, Common Cerulean and Zebra Blues. 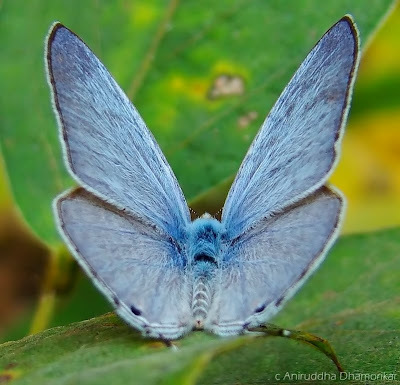 Another blue – Catachrysops strabo (commonly called Forget-me-not) is confused with Gram Blue, however both are rather distinctive in morphology as well as behavior. 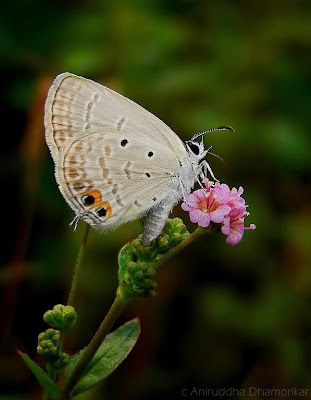 Forget-me-not, as it is commonly called is a comparatively larger butterfly than Gram Blue. 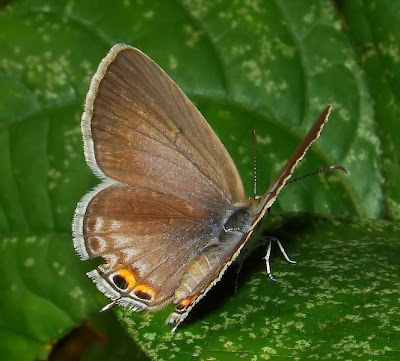 The hind wings are quite different from Gram Blue, with less dominant two black spots on the hind-wing and a small spot at the margin of (closer to the apex and far from the head) fore-wing. It is distributed throughout India. 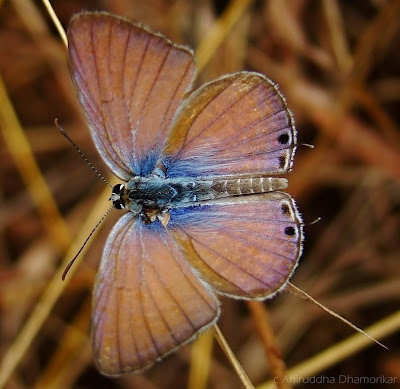 The flight of Forget-me-not is random and fast and is a territorial butterfly (males) often seen fighting rival males. They settle abruptly and are commonly seen basking in the late morning sun. 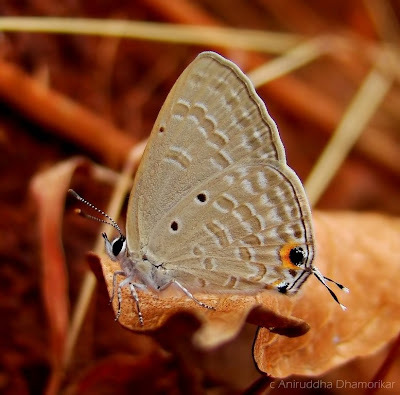 My search for the identity of a butterfly from the Blues family led me to your blog, Aniriddha. It is a pleasant surprise; the blog is tastefully done and your presentation on the Gram Blues is very informative with precise text and excellent pictures. I was searching for the differences between gram blue and plains cupid and stumbled upon this. It is very informative. Can you please give the difference of these two alongside. 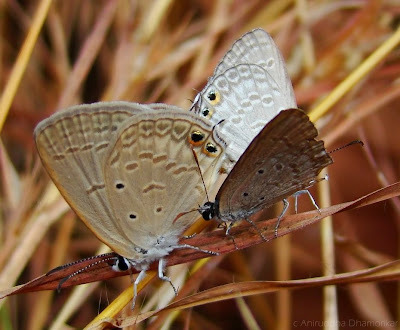 I think plains cupid and gram blue are even more confusing and hard to distinguish.